Computational neuroscience is a relatively new but rapidly expanding area of research which is becoming increasingly influential in shaping the way scientists think about the brain. Computational approaches have been applied at all levels of analysis, from detailed models of single-channel function, transmembrane currents, single-cell electrical activity, and neural signaling to broad theories of sensory perception, memory, and cognition. This book provides a snapshot of this exciting new field by bringing together chapters on a diversity of topics from some of its most important contributors. 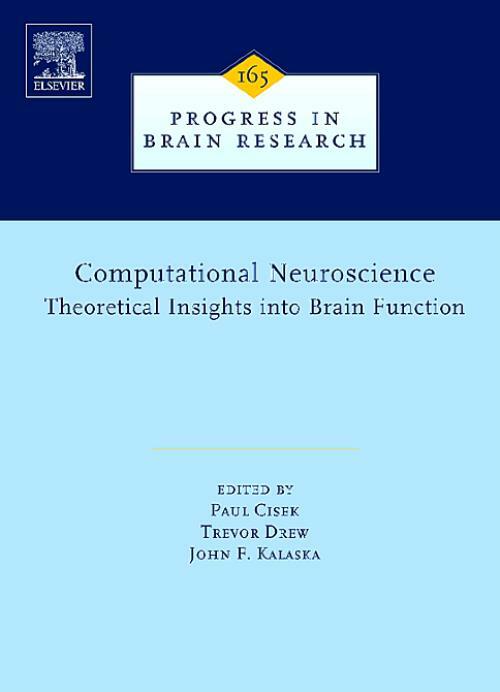 This includes chapters on neural coding in single cells, in small networks, and across the entire cerebral cortex, visual processing from the retina to object recognition, neural processing of auditory, vestibular, and electromagnetic stimuli, pattern generation, voluntary movement and posture, motor learning, decision-making and cognition, and algorithms for pattern recognition. Each chapter provides a bridge between a body of data on neural function and a mathematical approach used to interpret and explain that data. These contributions demonstrate how computational approaches have become an essential tool which is integral in many aspects of brain science, from the interpretation of data to the design of new experiments, and to the growth of our understanding of neural function. E.P. Cook, A.C. Wilhelm, J.A. Guest, Y. Liang, N.Y. Masse and C.M. Colbert (Montreal QC, Canada and Houston, TX, USA). L.F. Abbott and R. Rohrkemper (New York, NY, USA and Zurich, Switzerland). R. Shapley, M. Hawken and D. Xing (New York, NY, USA). T. Serre, G. Kreiman, M. Kouh, C. Cadieu, U. Knoblich and T. Poggio (Boston, MA, USA). D.B. Walther and C. Koch (Urbana, IL, and Pasadena,CA, USA). S. Grossberg (Boston, MA, USA). J.Z. Tsien (Boston, MA, USA). K.M. MacLeod and C.E. Carr (College Park, MD, USA). L. Maler (Ottawa, ON, Canada). A.M. Green and D.E. Angelaki (Montreal, QC, Canada and St. Louis, MO, USA). E. Marder, A.-E. Tobin and R. Grashow (Waltham, MA, USA). I.A. Rybak, A.P.L. Abdala, S.N. Markin, J.F.R. Paton and J.C. Smith (Philadelphia, PA and Bethesda, MD, USA and Bristol, UK). S. Grillner, A. Kozlov, P. Dario, C. Stefanini, A. Menciassi, A. Lansner, J. Hellgren Kotaleski (Stockholm, Sweden and Pontedera, Italy). D.A. McCrea and I.A. Rybak (Winnipeg, MB, Canada and Philadelphia, PA, USA). A. Prochazka and S. Yakovenko (Edmonton, AB and Montreal, QC, Canada). A.G. Feldman, V. Goussev, A. Sangole and M.F. Levin (Montreal and Laval, QC, Canada). L.H. Ting (Atlanta, GA, USA). S. Giszter, V. Patil and C. Hart (Philadelphia, PA, USA). I. Kurtzer and S.H. Scott (Kingston, ON, Canada). How is somatosensory information used to adapt to changes in the mechanical environment? T.E. Milner, M.R. Hinder and D.W. Franklin (Burnaby, BC, Queensland, Australia and Kyoto, Japan). K.A. Thoroughman, M.S. Fine and J.A. Taylor (Saint Louis, MO, USA). J.W. Krakauer and R. Shadmehr (New York, NY and Baltimore, MD, USA). N.I. Krouvhev and J.F. Kalaska (Montreal, WC, Canada). D. Zipser and E. Torres (Pasadena, CA, USA). S. Schaal, P. Mohajerian and A. Ijspeert (Los Angeles, CA, USA, Kyoto, Japan and Lausanne, Switzerland). W.J. Freeman (Berkeley, CA, USA). T. Gisiger and M. Kerszberg (Paris, France). P. Cisek (Montreal, QC, Canada). L. Paninski, J. Pillow and J. Lewi (New York, NY, USA and London, UK). J. Beck, W. Ma, P.E. Latham and A. Pouget (Rochester, NY, USA and London, UK). Y. Bengio (Montreal, QC, Canada).